The Alexandra Park Bike Club is running as a pilot scheme out of a premises beside the golf club in Dennistoun’s Alexandra Park where they are signing up members of all ages this summer to borrow bikes for free. A variety of bikes of all sizes are available – great for using on all of the trails in the park. They even have electric bikes coming soon for people to try. said Iona Shepherd, one of the organisers of the Alexandra Park Bike Club. The Borrow A Bike service is open every day from noon to 7pm. Just take some ID and something with your address on it and they’ll sign you up as a member. They have helmets and locks available should you need them. In the future they also hope to run cycle training, led rides, and bike maintenance services. Find out more about what is going on at the club on their facebook page. 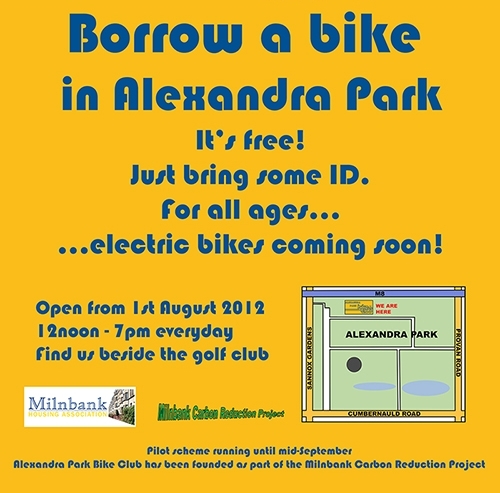 The Alexandra Park Bike Club have been founded as part of the Milnbank Carbon Reduction Project in partnership with the Milnbank Housing Association. They have been up and running for less than a week but have already signed up loads of new members for plenty of borrows.